The Intimus GC-210 business card slitter by Martin Yale allows you to rapidly produce business cards at a speed of up to 300 per minute. With just two quick passes through the GC-210 slitter and your 10-up cards on 8½” x 11″ sheets are cut down to 3½” x 2″ with ease. The GC-210 is designed to produce high quality full bleed business cards out of letter sized sheets printed by a color laser printer or copier. Any organization with a color copier and frequent need to order business cards will find that the GC-210 pays for itself. This machine is also great for printers, copy shops, in-plant print shop. The “Gutter Cut” design allows the blank space in between each of the business cards on the full printed sheets to be trimmed and allows you to extend the ink off the card’s edge or bleed it. With adjustable side guides this machine gives you the flexibility to move the paper feed position by simply adjusting the machine. The large, built-in waste catching bin saves time by automatically stripping the excess paper away from the cards and the hardened steel semi-self sharpening blades ensure years of operation without sharpening or replacement. You can use most professional design software programs to create your cards, such as Quark, InDesign, Illustrator, Pagemaker, PhotoShop Word and Publisher. 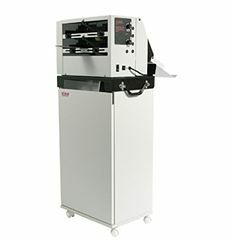 If you have any questions or are interested in purchasing the GC-210 Business Card Slitter, visit us at SpiralBinding.com. We have great pricing on a full line of Business Card Slitters. Call us at 1-800-631-3572 for more information!